This booklet is dedicated to the survivors of cancer who have struggled with great difficulty to achieve a satisfying and productive quality of life after their diagnosis and treatment. Their courage and perseverance have inspired others to live their lives to the fullest. When you have a medical problem, it is important to take action. The sooner you are seen by your physicians/medical team, the quicker your care management plan and therapy can be implemented so you can recover and regain your health faster. The medical community generally defines a cancer survivor simply as anyone who has been diagnosed with cancer. Although cancer remains the second leading cause of death next to heart disease in the United States, more and more people are surviving this chronic illness. There are now over 10 million cancer survivors living in the United States. Prevention, screening, early detection, diagnosis, and treatment along with advancing medical knowledge and technology are changing the odds, but it will take time for a worldwide effort to conquer cancer. Once you are diagnosed with cancer your life has been changed forever, and although you may have gone through successful treatments and achieved a remission or cure, you still may live with fear of a recurrence, a new cancer, latent side effects, or the possibility of functional disability, emotional changes, and even death. Your attitude, your philosophy of life, and how you manage your health care needs can make a big difference in how you cope and recover following the diagnosis and treatment of cancer. Remember Saint George and the Dragon? Everyone faces crises and problems in life which may seem insurmountable, and yet with courage, faith, and hope it is possible to confront the dragon, not be overwhelmed, and to go forth in life with better health and survival. Cancer survivors begin a new lifelong battle, which is best fought through a team approach. People are living longer following diagnosis, detection and improved treatments. Follow-up care is essential to promote long-term survival. For example, amputation, hair loss, or a colostomy bag. Approximately one third of cancer survivors experience depression and anxiety severe enough to require medication and professional help. This is necessary to ensure early diagnosis of a recurrence or a new cancer which, treated earlier, could lead to a cure or another remission, or help control potential late side effects from therapy. Even for those who have full insurance, expenses can be a problem, as cancer care often involves extra, unplanned expenses. Advice and help are available from the National Coalition for Cancer Survivors (NCCS) publication, "What Cancer Survivors Need to Know about Health Insurance" (www.canceradvocacy.org). The American Cancer Society and the National Cancer Institute can also be of help. The goals of the Cancer Survivorship Programs are to provide knowledge and education and guidance to survivors, families and friends through programs that promote healthy nutrition, exercise, and supportive and preventive care. Overviews of the elements of the Survivorship Program are presented in this booklet. The booklet serves as a roadmap to guide survivors toward a healthier life; it provides information, recommendations, and resources that promote health and wellness, disease prevention, and disease control and cure for a satisfactory quality of life and prolonged survival. Section 1: Coming to Grips, describes some of the difficult issues confronting survivors after their brush with mortality and strategies and resources to address them. Starting right from diagnosis, cancer survivor care is multidisciplinary and highly specialized, including treatment and follow-up care for new and current medical problems that may or may not be related to cancer (called co-morbid conditions -for example, heart disease, stroke, diabetes, overweight and obesity, osteoporosis or hypertension) but can affect the patient's overall health, survival, and quality of life. At the present time, the risks of lifelong side effects are being controlled and reduced only partially. 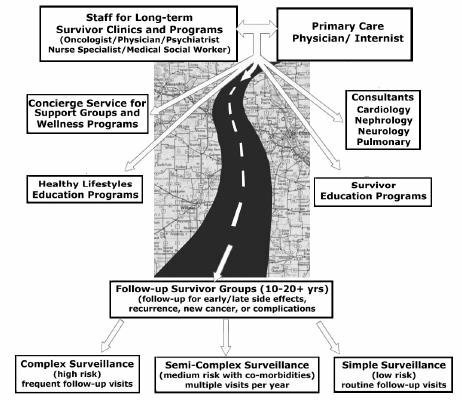 The proactive Survivorship Care Plan approach of structured surveillance and intervention is designed to help reduce complications or late toxic side effects from cancer and its therapy. Section 2: The Survivorship Care Program, describes the plan provided by the medical oncology team to schedule and track treatments, screening results and other aspects of your individualized survivor care. The section also explains how you can create your own personal health record for secure storage and sharing through the Internet. The warning signs of potential recurrence or new cancers are also discussed. Section 3: Caregivers, describes the Survivorship Care program's organized approach to aid family members and friends in getting and giving advice and assistance in the care of cancer survivors. Social and cultural attitudes, values, and peer pressure play a role in lifestyle choices; family, friends, and community social support can help cancer survivors choose healthy habits. Section 4: The Healthy Lifestyle Imperative, provides an overview of why healthy lifestyle habits are critical. There is a definite relationship between lifestyle and post-cancer therapy survival. It has been well-established that through exercise and a healthy diet and psychological supportive care, one can decrease the risk of recurrence, increase survival and longevity, and reduce the risk of toxic cancer treatment-related side effects as well as improve quality of life. Section 5: Nutrition for Healthy Survivorship, describes the dietary elements needed to promote better health. Section 6: Benefits of Physical Activity, describes the effects of exercise on specific cancers and activity elements for a phased exercise program. Section 7: Surviving the Emotional Impact of Cancer, addresses emotional issues, support resources, and strategies to help achieve peace of mind and spirit. Section 8: Survival with Disease and Side Effect Control, provides descriptions and prevention measures for controlling potential co-morbid conditions and for coping with and controlling some of the side effects of cancer therapies. Section 9: Treatment Side Effects and Solutions, addresses co-morbidities secondary to surgery, chemotherapy and radiotherapy. Section 10: Common Co-morbidities that Affect Survival, discusses heart, lung, liver and kidney problems, obesity, osteoporosis and infertility. Section 11: Planning for Your Future by Getting Your Affairs in Order, discusses wills, advanced directives, social and financial planning, and end-of-life care needs. This booklet provides only summary information on the topics addressed. For more detailed information, please refer to Everyone's Guide to Cancer Survivorship (available in bookstores in October 2007) or www.cancersupportivecare.com. Additional books and website resources are listed in the Appendix. We appreciate the efforts of the American Society of Clinical Oncology (ASCO), the National Institutes of Health (NIH), the Institute of Medicine (IOM), the National Coalition for Cancer Survivors (NCCS), the American Cancer Society (ACS), The Lance Armstrong Foundation and the Office of Cancer Survivorship (at the NIH) for their leadership efforts to promote survivorship programs to improve the quality of life for cancer survivors. The foundational survivorship concepts expanded upon in this booklet were initially articulated by the IOM Committee on Cancer Survivorship: Improving Care and Quality of Life in their book, From Cancer Patient to Cancer Survivor, Lost in Transition, 2005, from the National Cancer Institute Press. Parts of this Booklet have been adapted from Everyone's Guide to Cancer Supportive Care by Ernest H. Rosenbaum, MD and Isadora Rosenbaum MA. We wish to thank Karen Staller, Diane Maglieri, Susan Lowenberg and The Mount Zion Health Fund for support and assistance in helping develop the Cancer Survivorship Care Program. We wish to thank Gail Sorrough, MLIS for her editing advice.